Taking the leap out of classic folklore of star-crossed lovers Layla and Majnun, the story is set in today's time in Kashmir where Laila and Majnu have problems relevant to the youth of today. While dealing with their feuding families a passionate love story unravels. Laila, shown as a girl living in her own fantasy world, always dreaming of a 'special' person in her life, has an encounter with Qais (Majnu) on a fateful night when she secretly left her house to pray in a graveyard for meeting her loved one. Qais and his friends find her identity and chase her till Laila finally gives her mobile number to him. The story advances to the romantic intimacy between the leads, against the background of rivalry between their families. News of their romance soon becomes the talk of the town, which eventually reaches the family of Laila and her father warns her to stay away from person of such a bad reputation. But Laila is keen to meet Qais, despite being warned by her father and sister of the consequences. They meet one night and plan to disclose their relationship to their respective families, and Qaiz promises that he will do whatever possible to convince Laila's family. But before this can happen, they are caught red-handed by Laila's family, after which her father decides to marry her to Ibban, who is a politically motivated person trying to grasp every opportunity to marry Laila in order to take benefit of her father's repute and position. Laila resists the wedding and waits for Qais to convince her father, and sends his father to convince Laila's father but due to the long ongoing feud between the family, Laila's father disrespects and shuns the proposal, to which the father of Qais promises Laila's father that he will ensure that the marriage happens. When Qais gets to know about the date of Laila's marriage he comes to see Laila's father to try for the last time. On the day of her wedding, Qais reaches her house and asks Laila in front of her whole family to escape from the wedding with him, but shockingly Laila refuses, saying that she waited for him and is now convinced that people were right about Qais being easy going and playing with others' emotions. Qais leaves heartbroken. Meanwhile, after four years, Qais' father, who is a top politician in Kashmir, dies of cardiac arrest and Qais is shown to be in London. Qais returns to Kashmir for his father's funeral, where he encounters his sister and her husband, who desire the father's property, disturbs him emotionally. One day, Qais along with his friends see Laila in a café and Qais leaves the café in anger in order to avoid her. Laila is now married to Ibban, who is a MLA, a typical corrupt man and a drunkard and lives a disturbed life. News reaches Laila about Qais' presence in town for his father's funeral, and she decides to meet him. With help of Qais' friend, they meet where Qais collapsed after seeing Laila and Laila leaves him, grieving their separation. One day, Ibban learns of Laila's whereabouts and tries to prevent her from leaving the house, where Laila warns him that his public reputation can lead to losing his position. Laila and Qais meet again and she reveals that Ibban is soon going to divorce her and then they can live together, which makes Qais even more anxious. One night, the drunken Ibban has an accident and dies. Laila is now free from his shackles and tells Qais that after Iddat (the period after divorce or death of her husband when a woman remains secluded), they can marry and live happily forever in Kashmir. Qais, who is now shown to lose his personality, is frustrated because of the endless waiting for togetherness, leaves for Pahalgam till the Iddat, where he is seen to completely lose his mind and imagines Laila everywhere and is considered a lunatic by the villagers and beaten up. Laila is informed of Qais' condition and she reaches Pahalgam and discovers that Qais is emotionally disturbed and constantly reciting 'Laila'. She understands that Qais has lost contact with his surroundings. Seeing his condition and his endless wait for Laila, Laila refuses to stay with Qais as she understands that Qais does not require her anymore as he imagines Laila to present everywhere. Heartbroken, Laila kills herself and Qais is shown running and chasing Laila until he is hit by her gravestone. The movie ends with their spirits being together and happy forever. Niladri Kumar, Joi Barua and Alif. Hitesh Sonik composed the film's background score and Niladri Kumar, Joi Barua and Alif composed the songs. The lyrics were written by Irshad Kamil, Mehmood Gaami and Mohammad Muneem. The first song, "Aahista", was released on 9 August 2018. This was followed by the title track, "O Meri Laila", on 13 August 2018. ^ "Ekta Kapoor shifts gears with Imtiaz Ali's 'Laila Majnu'". 7 August 2018. ^ "Laila Majnu New Poster: This Is When You Can Watch The Trailer". ^ "Laila Majnu has less logic and more passion: Imtiaz Ali". 23 July 2018. ^ "Laila Majnu Trailer: Imtiaz Ali Brings Madness, Love and Bullets Together". ^ "Laila Majnu Trailer: Imtiaz Ali is back, this time, with the 'baap' of all tragic love stories". 7 August 2018. ^ "'Laila Majnu' trailer: The Imtiaz Ali film is an intense love story with a touch of madness - Times of India". ^ "Laila Majnu trailer: Imtiaz Ali, Ekta Kapoor's modern adaption tells a riveting love story set in Kashmir- Entertainment News, Firstpost". ^ "Laila Majnu trailer: Imtiaz Ali presents a new spin on the classic love story". 7 August 2018. ^ "Imtiaz Ali: 'Laila Majnu' is an unsafe film to make - Times of India ►". The Times of India. Retrieved 10 August 2018. 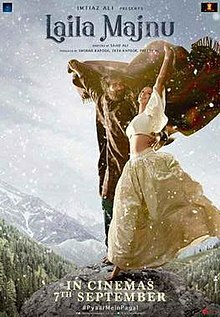 ^ "Laila Majnu" – via www.imdb.com. ^ "Laila Majnu - Original Motion Picture Soundtrack". Saavn. ^ "Laila Majnu song 'Aahista' captures lead pair's love story before launching into tragic climax- Entertainment News, Firstpost". Firstpost. Retrieved 10 August 2018. ^ "Laila Majnu song 'O Meri Laila' shows Tripti Dimri, Avinash Tiwary frolicking to traditional Kashmiri music". Retrieved 14 August 2018. ^ FC, Team (1 April 2019). "FC Film Club Award Winners". Film Companion. Retrieved 4 April 2019.